Two views of "Red Rocks" in Emporia, Kansas. This house at 927 Exchange was home to William Allen White, nationally and internationally known editor of the Emporia Gazette, from 1899 until his death in 1944. Here the White family entertained several U.S. presidents-- Theodore Roosevelt, William Howard Taft, Warren Harding, Calvin Coolidge, and Herbert Hoover-- and prominent Americans, such as Edna Ferber, Frank Lloyd Wright, Walt Mason, and Jane Addams. The home is made of bright sandstone from Colorado, which covers the first story. The top two stories of the house are red pressed brick, stucco, and wood strips. The red sandstone is believed to be from a quarry in Red Rock Canyon near the Garden of the Gods, Colorado Springs, Colorado. Almerin Gillett, lawyer and cattle entrepreneur began building the house around April 1888. Due to drought and a drop in the cattle market, Gillett was unable to complete the construction. His wife, Eugenia, died in 1892, and Gillett soon moved to Kansas City where he died in 1896. In 1915 William Allen White wrote to architect Frank Lloyd Wright and suggested that he "do over" the house. 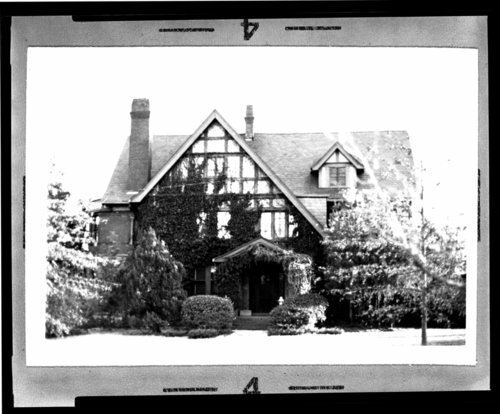 Wright soon began to develop preliminary designs for the house. White and Wright continued their discussions of design until around November 1919, when White contacted the architectural firm of Wight & Wight in Kansas City. William Allen and Sallie lived at the home until their deaths. William Allen died in 1944; Sallie in 1950. Their son and daughter-in-law, William Lindsay and Kathrine Klinkenberg White, moved into the house around 1955, although they also maintained a residence in New York City. The site was designated a National Historic Landmark in 1976. William Lindsay died in 1973 and Kathrine died in 1988. In 2001 Paul David and Barbara White Walker, their daughter, donated this site to the state of Kansas to be operated as Red Rocks State Historic Site. Two views of "Red Rocks" in Emporia, Kansas. This house at 927 Exchange was home to William Allen White, nationally and internationally known editor of the Emporia Gazette, from 1899 until his death in 1944. Here the White family entertained several U.S. presidents-- Theodore Roosevelt, William Howard Taft, Warren Harding, Calvin Coolidge, and Herbert Hoover-- and prominent Americans, such as Edna Ferber, Frank Lloyd Wright, Walt Mason, and Jane Addams. The home is made of bright sandstone from Colorado, which covers the first story. The top two stories of the house are red pressed brick, stucco, and wood strips. The red sandstone is believed to be from a quarry in Red Rock Canyon near the Garden of the Gods, Colorado Springs, Colorado. Almerin Gillett, lawyer and cattle entrepreneur began building the house around April 1888. Due to drought and a drop in the cattle market, Gillett was unable to complete the construction. His wife, Eugenia, died in 1892, and Gillett soon moved to Kansas City where he died in 1896. In 1915 William Allen White wrote to architect Frank Lloyd Wright and suggested that he "do over" the house. Wright soon began to develop preliminary designs for the house. White and Wright continued their discussions of design until around November 1919, when White contacted the architectural firm of Wight & Wight in Kansas City. William Allen and Sallie lived at the home until their deaths. William Allen died in 1944; Sallie in 1950. Their son and daughter-in-law, William Lindsay and Kathrine Klinkenberg White, moved into the house around 1955, although they also maintained a residence in New York City. The site was designated a National Historic Landmark in 1976. William Lindsay died in 1973 and Kathrine died in 1988. In 2001 Paul David and Barbara White Walker, their daughter, donated this site to the state of Kansas to be operated as Red Rocks State Historic Site.